Now I love me a good rant against a student or two, and College Misery fits the bill. The community is tight over there, so I can see why one of their members turned to the group to ask for career advice. For starters, I applaud Raul from Russellville for sending his question to College Misery instead of a general-advice columnist. Not to snub Cary Tennis, the go-to advice columnist for grad students, but the people at College Misery … well, they know the misery. But Sense & Sangria can’t resist chiming in. 1. I struggled in that first semester, but worked hard through it. I was astonished at the students, how exquisitely dumb they were, how fantastically lazy, how creatively they avoided work. 2. It is not just the students. My colleagues are closed off. My attempts to be collegial are often rebuffed or ignored. I haven’t come in expecting to be beloved or anything, but I find that I’m just ignored, left to fend for myself. At first read, I wonder if maybe it’s not Raul’s career that’s the problem but the job itself. If his students are assholes and his colleagues are borderline assholes, then the best solution is to find another job. Ah … but there are barely any jobs in academia. It’s not as if he can pack up and move anywhere. For that reason, I say what I often say in Sense & Sangria: There is no shame in quitting. If he’s worried about what family and friends might think, he might be surprised. Some of them might ask him why he didn’t do it sooner. I noted that many of the commenters on College Misery said that Raul should at least wait his first year because it might get better. Hey, they’re professors, and they know better than me, a mere grad-student turned Hamster. On a financial level, he should definitely tough it out for as long as he can until he can save up an emergency fund. But I don’t think that people should waste time at careers they don’t enjoy, no matter how much time they put into it. Perhaps Raul can last until some of the assholes leave his department, but if he’s really miserable, he shouldn’t stay in a bum job just because he made a time investment decision that didn’t work out. 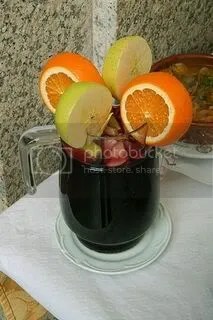 Image of a trippy sangria from Tamorlan from Wikimedia Commons under a Creative Commons license. Grad student advisors, some of you are seriously not stepping up. Most of your students are turning to Cary Tennis for academic advice instead. The latest academic letter to Tennis is a twist on the usual formula, with a student who already has a PhD freaking out about lost opportunities and job prospects. This letter writer needs to schedule an appointment with a professional ASAP. No matter what Cary Tennis or Sense & Sangria says, academia is only part of the problem. In fact, academia may have made a depressive disorder worse. 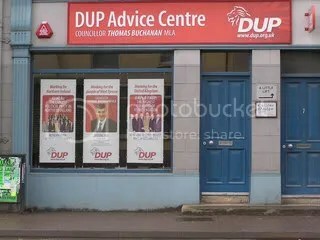 DUP Advice Centre, Omagh. Image by Kenneth Allen from Wikimedia Commons under a Creative Commons license.